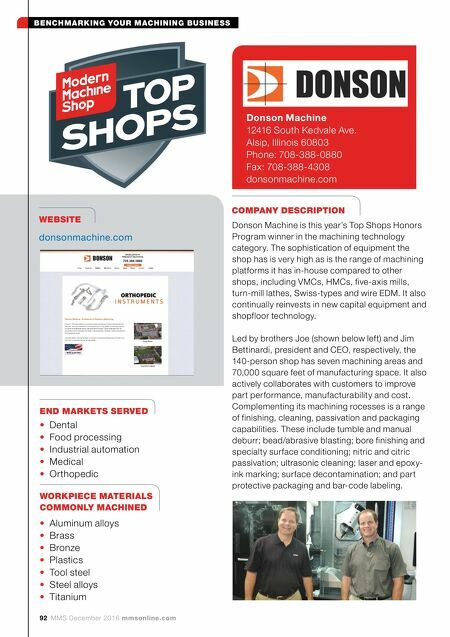 92 MMS December 2016 mmsonline.com BENCHMARKING YOUR MACHINING BUSINESS END MARKETS SERVED WEBSITE donsonmachine.com COMPANY DESCRIPTION WORKPIECE MATERIALS COMMONLY MACHINED Donson Machine 12416 South Kedvale Ave. Alsip, Illinois 60803 Phone: 708-388-0880 Fax: 708-388-4308 donsonmachine.com • Dental • Food processing • Industrial automation • Medical • Orthopedic • Aluminum alloys • Brass • Bronze • Plastics • Tool steel • Steel alloys • Titanium Donson Machine is this year's Top Shops Honors Program winner in the machining technology category. 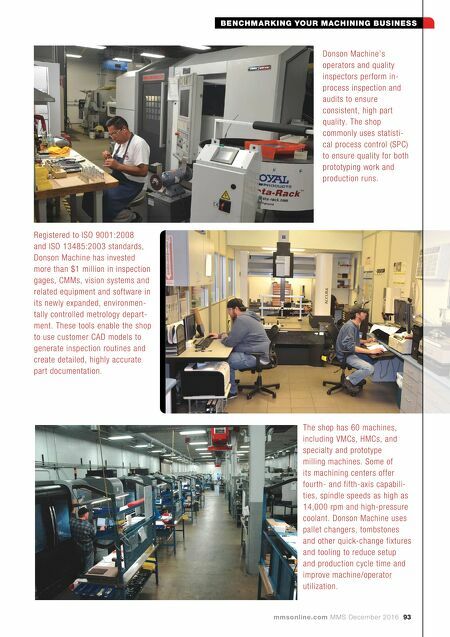 The sophistication of equipment the shop has is very high as is the range of machining platforms it has in-house compared to other shops, including VMCs, HMCs, five-axis mills, turn-mill lathes, Swiss-types and wire EDM. It also continually reinvests in new capital equipment and shopfloor technology. Led by brothers Joe (shown below left) and Jim Bettinardi, president and CEO, respectively, the 140-person shop has seven machining areas and 70,000 square feet of manufacturing space. It also actively collaborates with customers to improve part performance, manufacturability and cost. Complementing its machining rocesses is a range of finishing, cleaning, passivation and packaging capabilities. These include tumble and manual deburr; bead/abrasive blasting; bore finishing and specialty surface conditioning; nitric and citric passivation; ultrasonic cleaning; laser and epoxy- ink marking; surface decontamination; and part protective packaging and bar-code labeling.